In the Hotel Plaza’s case rooms are of varying sizes and are all very pleasant with cream-colored decorations throughout and impressive terracotta tiled floors and period wooden furniture. They walls are covered with prints by local Cuban artists. The bathrooms are tiled in lustrous white from floor to ceiling and are clean. The windows offer wooden shutters for the sun during the hottest part of the day and allow and nice afternoon nap. Such details are only part of the Plaza’s historic charm. Arriving guests are greeted by authentic and colorful tiled floor of the lobby, beneath a beautifully-restored bas-relief ceiling surrounded by brilliant white columns. This inspiring layout surrounds a large, pleasant lobby bar with natural light from the stained-glass skylights above the central lobby fountain. Hotel Plaza Old Havana commemorated its 100 years of operations in 2009 and, like other properties in Old Havana this four-level early twentieth century building was restored and reopened in the 1990s to accommodate tourists looking to stay in Old Havana. 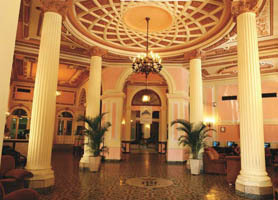 Hotel Plaza is well located for sightseeing in Old Havana, Centro Havana and Havana’s colorful Chinatown. Some rooms offer views of the Capitolio bulding. From your base at the Hotel Plaza Old Havana you are a few minutes’ walk from the Havana National Arts Museum, the Gran Teatro de La Habana and the Museo de la Revolución. Hotel Plaza Havana holds the unique accolade that Albert Einstein once stayed and dined at a luxurious banquet in the hotel, and the extensive guest list includes luminaries such as Isidora Duncan and Babe Ruth. The former baseball stars suite 216 is now a commemorative museum of nostalgia for American baseball fans, the rooms features El Bambino’s bat and ball used during his baseball career. Hotel Plaza is just one block away from Prado Street, a tree shaded and historic promenade in Old Havana and also across the street from the ritzy Parque Central Hotel which also shares the privileged location and makes for a perfect departure point for tours of Havana’s Old Town. Hotel Plaza is nicely situated right in the very heart of the city’s colonial center. Hotel Plaza has a fantastic rooftop restaurant and Bar Solarium area with a privileged view of the city and the impressive Bacardi Building. A more private setting is located at the 2nd floor inner patio, ideal for savoring an afternoon cappuccino or Cuba Libre. Other Hotel Plaza features include an executive meeting room located on the 5th floor of the hotel, with capacity for 90 people and audiovisual services including a video projector, large screen and laptop hook up. The hotel Plaza also offers an excellent WiFi service for guests in each room or non-guests in the lobby. As an economic hotel right in the center of Old Havana and seconds from all the Colonial city’s sights, the Hotel Plaza Old Havana cannot be beat. Plaza Hotel Old Havana is usually in very high demand and, as such, should be booked in advance. Our booking program allows reservations at Plaza hotel without down payment or deposit which will guarantee your dates and also allows preferential modifications should your dates change in the future. Our booking process is unique because it shows the best rate from all of these for Plaza hotel in Old Havana and the types of rooms available. 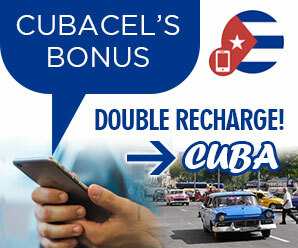 Our Plaza Hotel Old Havana rate comparison is an industry first for Cuban Hotels. Once you’ve compared the rates, finalizing the booking at Plaza Hotel takes just seconds and an immediate confirmation is provided in real-time.